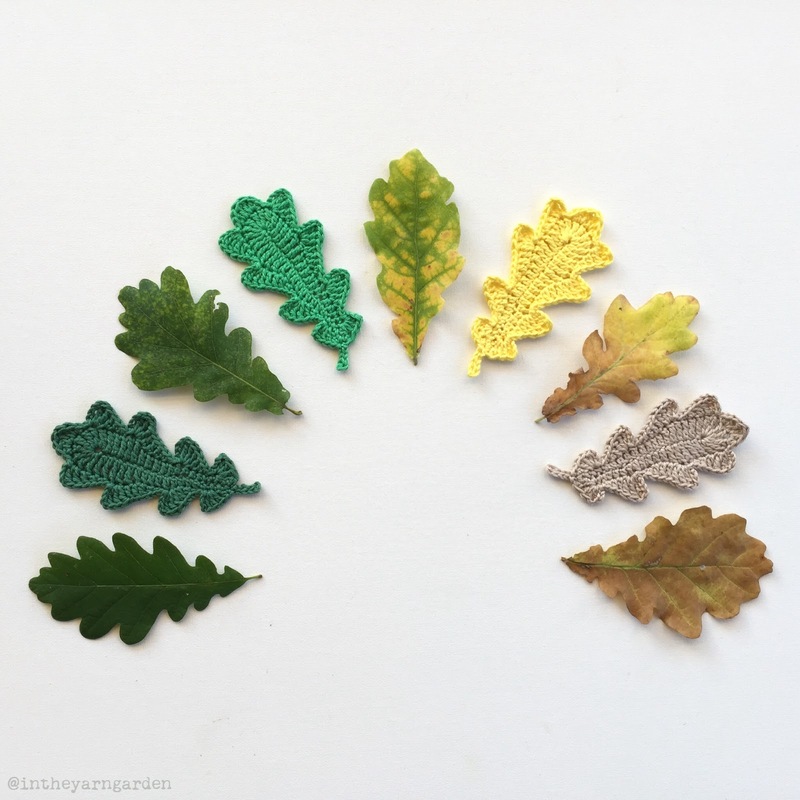 Some colorful oak leaves will cheer up a dark and rainy autumn day. 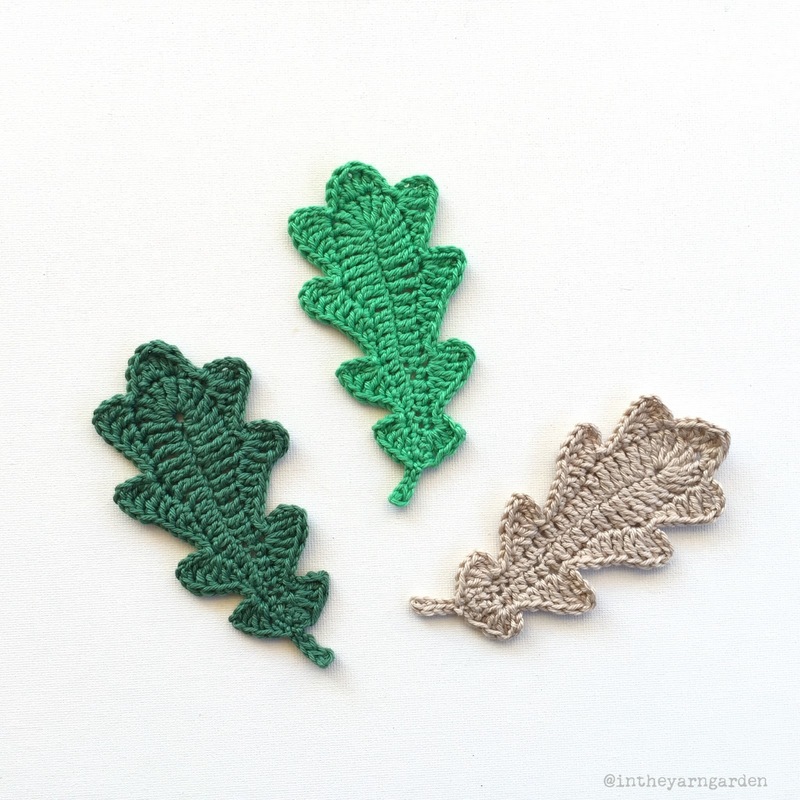 This is my oak leaf crochet pattern! Start by making 20 ch. Start in 2:nd ch from hook. 4 sc, 4 hdc, 5 dc, 5 tr. 8 tr in the last ch, turn around. Crochet mirrored on the way back i.e: 5 tr, 5 dc, 4 hdc, 4 sc. 1 sl st in the last ch. 1 sl st, 1 sc, 1 hdc, 1 dc, [2 tr, 4 ch, 1 sl st] in next st.
1 sl st, [1 hdc, 1 dc, 1 tr] in next st.
[1 sl st, 3 ch, 3 dc] in next st, skip next st, 1 hdc, 1 sl st in the last sl st of round 1. Stalk: ch 5, 1 sc in 2:nd ch from hook, 3 sl st, finish with 1 sl st in the last sl st of round 2. © Copyright In the Yarn Garden 2015. All rights reserved. Any redistribution or reproduction of part or all of the contents in any form is prohibited without permission from In the Yarn Garden. You are though very welcome to link to this site. You can sell items made from this pattern, please credit In the Yarn Garden as designer. You can not use my patterns or pictures for any kind of advertising. Thank you! Would you share with me what program you use to draw the crochet diagram? This crochet diagram was actually made by Järbo Garn. That’s a Swedish yarn company and this pattern was a collaboration with them. But for other diagrams I have used Inkscape. oh ok , Thank you! Est ce que je peux utiliser votre modèle de feuille de chêne pr vendre le produit fini? Je fabrique des broches. 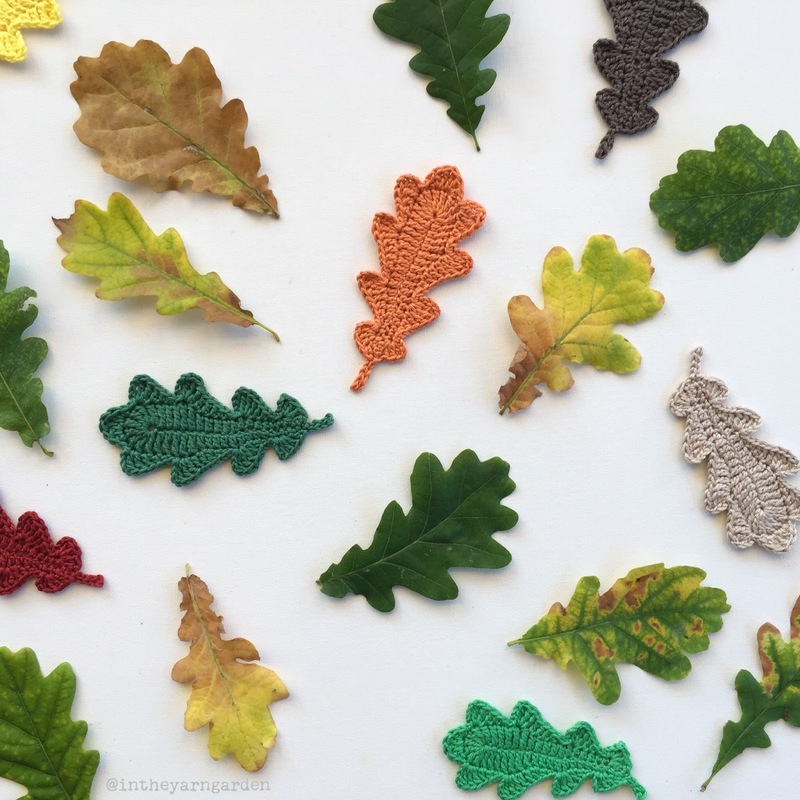 Yes it’s ok to use my oak leaf pattern 🙂 Just make sure that you credit me as the designer of the pattern!